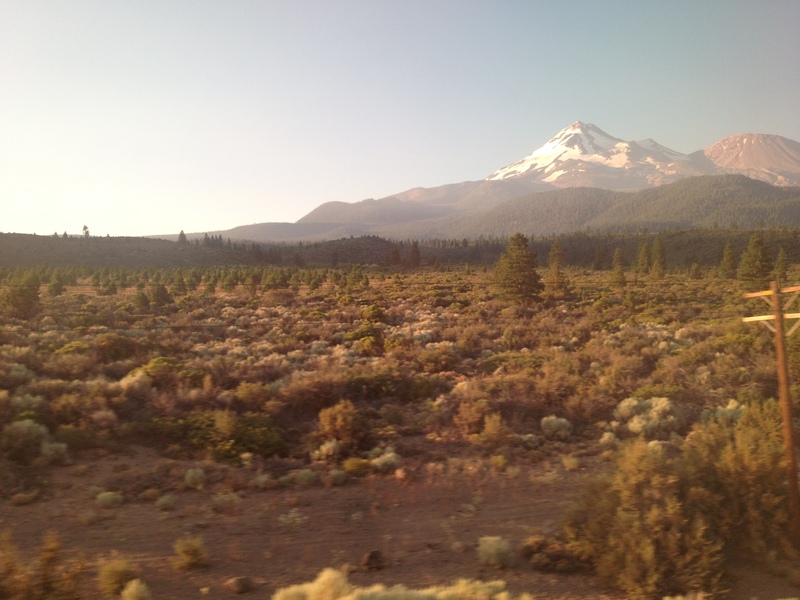 I re-boarded the Coast Starlight at midnight. Fortunately it was on time, so I didn’t need to wait too long in the station waiting room with the local scout troupe departing for their summer camp in Oregon. There had also been a carriage of scouts on the train from LA to Sacramento and on boarding in Sacramento, we found there was already another scout troupe on board from Long Beach; it seems there are many sites for scout camps in Oregon. The seat allocation system on Amtrak is an odd combination of manual and computerised. The number of seats available is fixed, and according to Amtrak their computer system only permits that number of tickets to be sold for each section between stations. Despite this, the ticket does not have a seat allocation attached to it. The allocation is done by the car attendants as passengers join the train. They have a grid for all the seats on which they note which station a passenger will be leaving the train when they first join it, marking the grid in pencil. This means that they should be able to identify which seats become available at each station and assign them to joining passengers. In practice, it does not always appear to work that way. 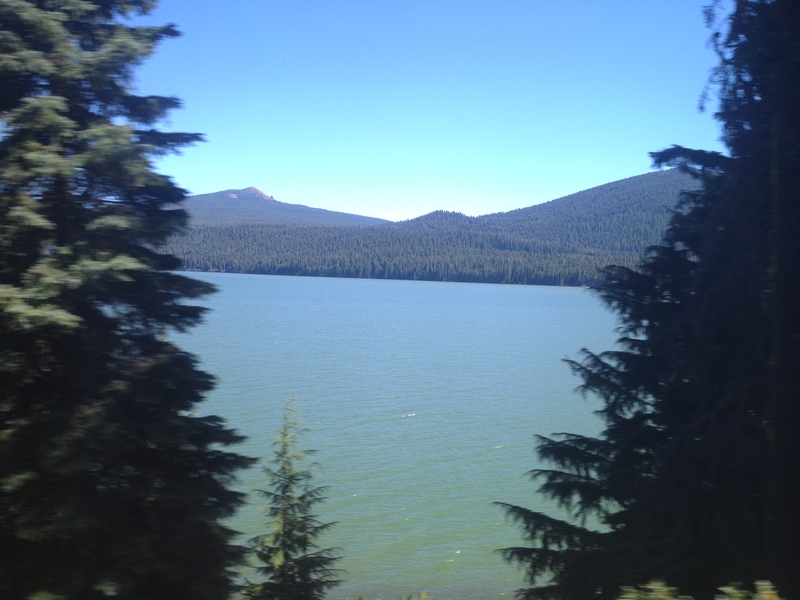 When we joined the train in Sacramento, the two coach car attendants implied that between them they only had nine seats available beyond the coach allocated to the scouts. We could see that there were more than nine of us standing on the platform wanting to join the train. Out tickets had all be scanned and identified as valid, so there should be enough seats. Not to hold things up too much, we were all ushered onto the train and asked to sit in the lounge car and we would get seats assigned. 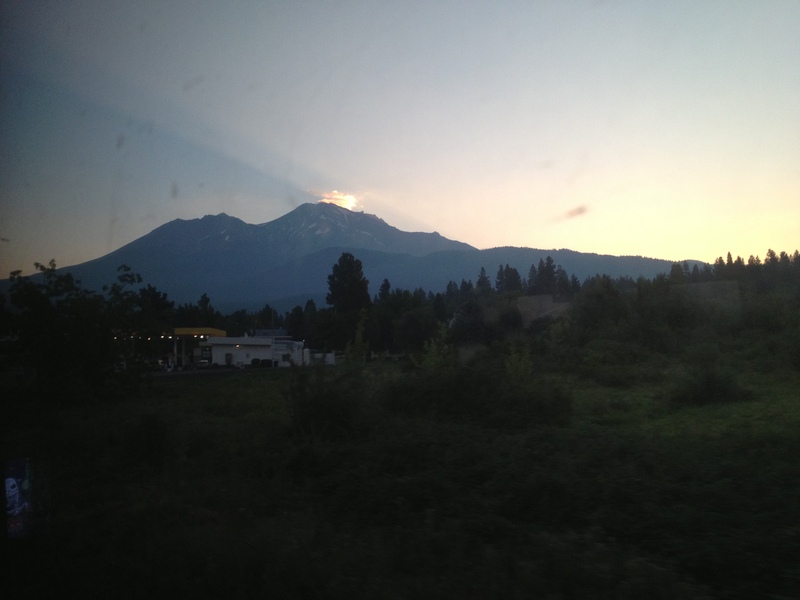 At midnight, I was a little tired and grumpy and when the attendants had passed us in the lounge car two or three times with worried looks on their faces and no seat assignments, I asked a passing conductor when we would get our seats. He seemed surprised we hadn’t been assigned seats and after a quick walk through the coach cars returned to the lounge car assigning me a seat. It seems that the attendants had missed noting which seats had been vacated earlier creating the ‘shortfall’. Finally at about 1 am, I settled down to get to sleep. and we travelled on north, I managed to catch a glimpse of Californian snow. The scenery was getting increasingly greener, although there were still irrigation systems in some of the arable crop fields, and the trees were predominantly needle trees. 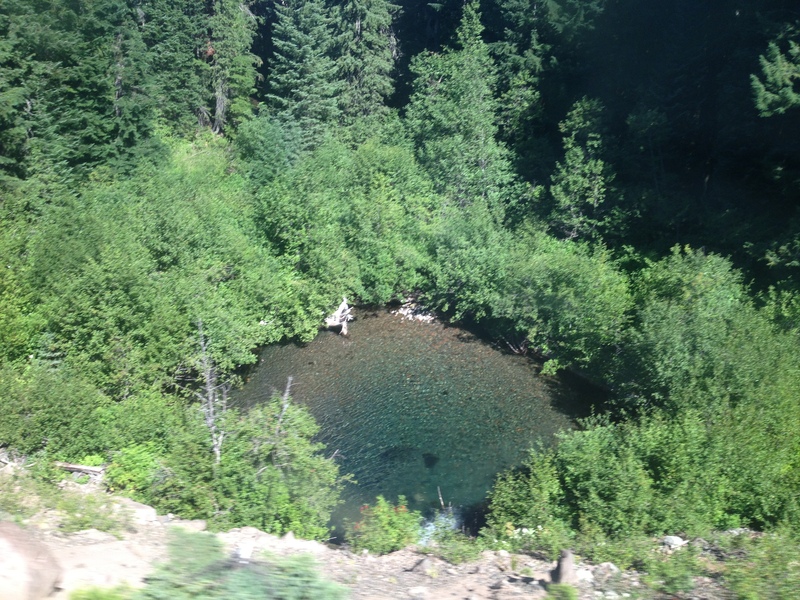 Right beside the track we passed this mountain spring. Considering how infrequent trains past here are, I think I would like to take a quick dip in such clear water one day. 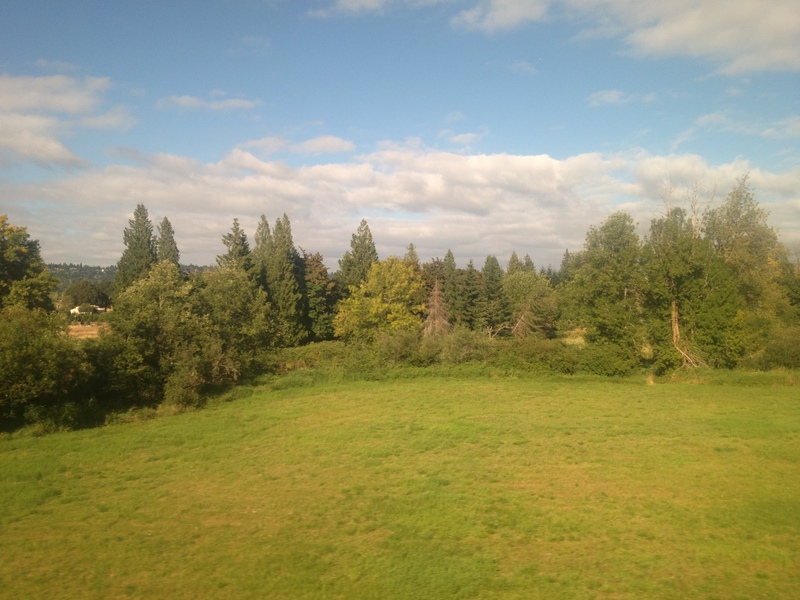 Approaching Eugene the saw mills accompanying the forestry business. 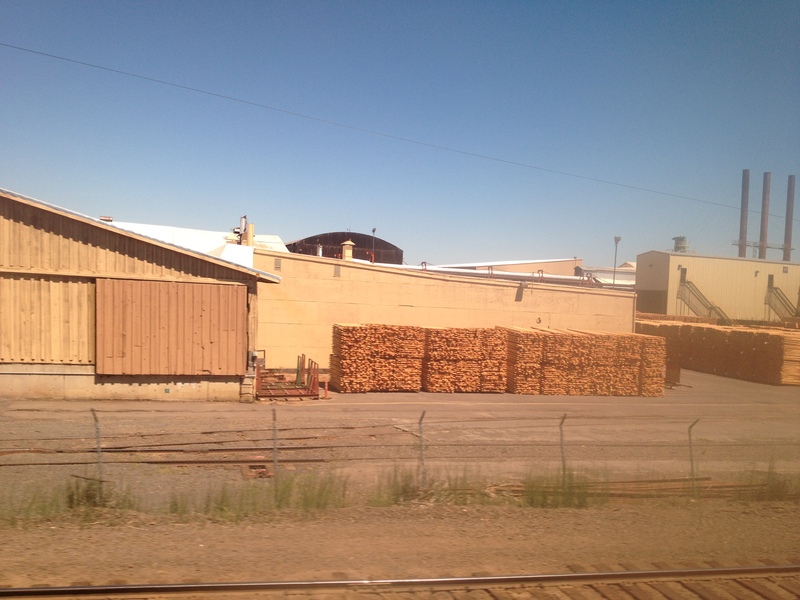 A train of 2x4s passed us too quickly to get an in-focus picture, here is a stationary set waiting to be loaded onto a later transport train. 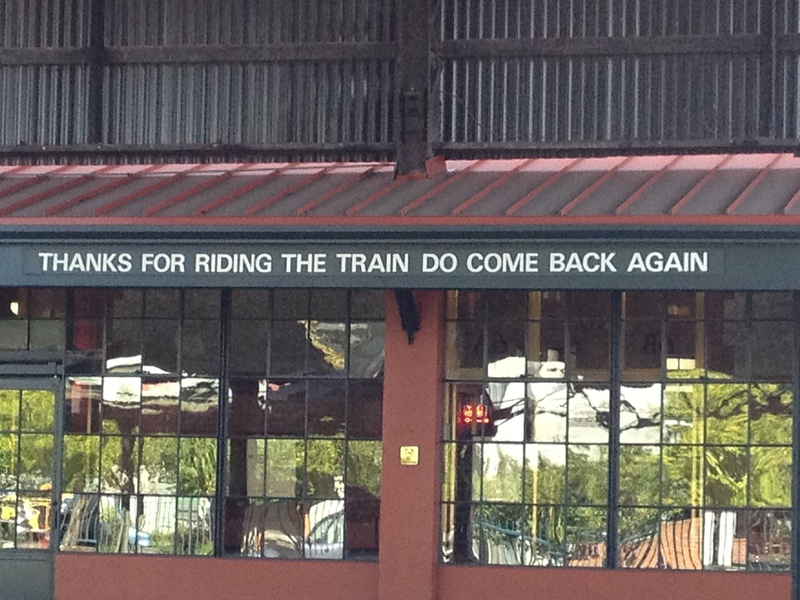 We had a leg stretch break at Portland Union station. 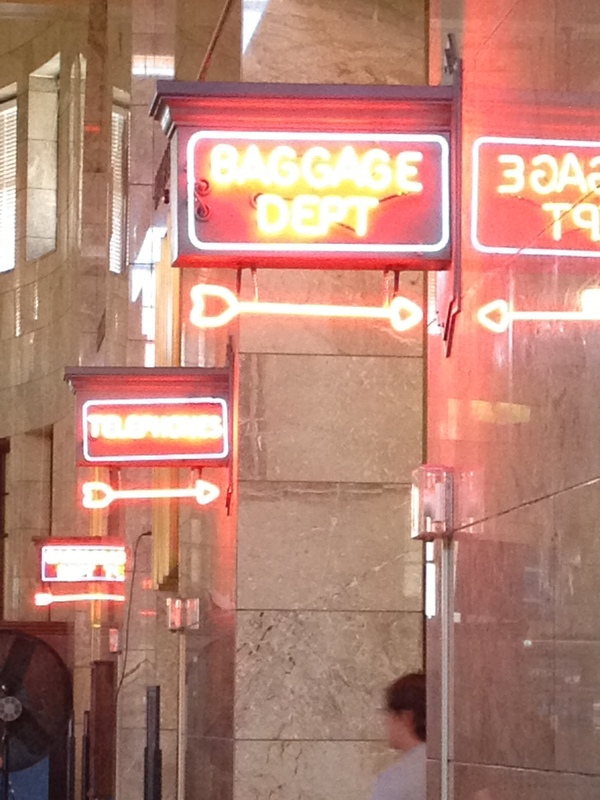 This station appears to have been decorated at a time when neon signs were the thing to have. 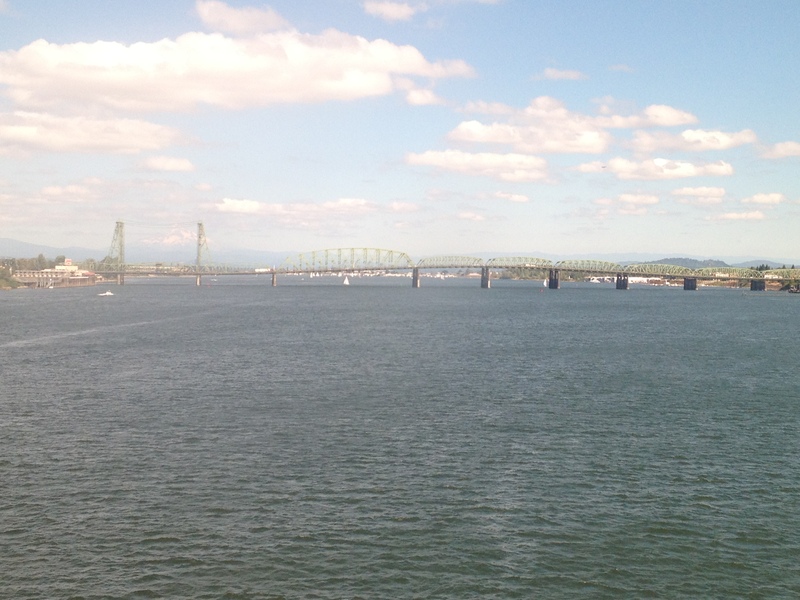 Shortly after leaving Portland, we crossed the Columbia river which marks the border between Oregon and Washington. I like this bridge over the river, the part closest to the northern bank being a drawbridge. 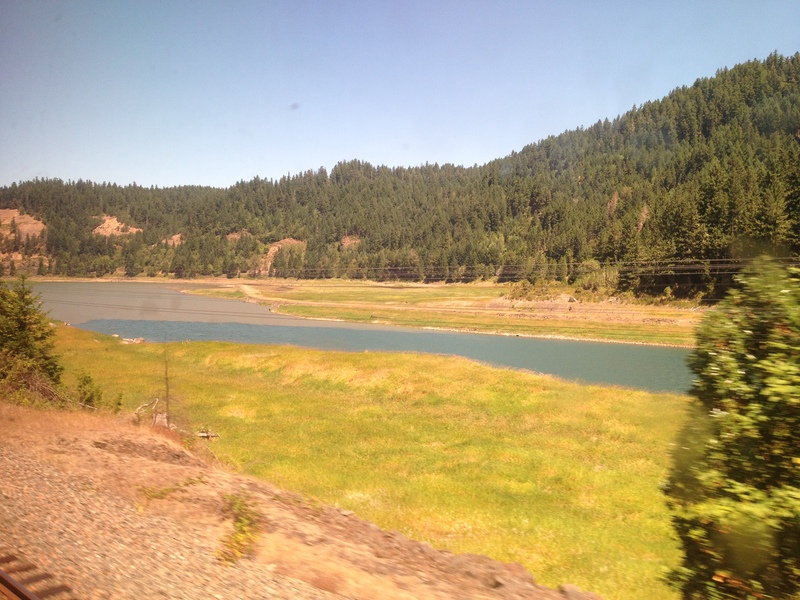 As we entered Washington, I finally saw a green field which did not have an irrigation system laid through it.